Though you can purchase packages of gift tags at just about any store that sells wrapping paper, it's a lot more fun to print your own! One Website that offers free, printable gift tag templates is FreePrintableGiftTags.net, which features gift tags for Christmas and Hanukkah (and a number of other occasions). About.com's Desktop Publishing section has a comprehensive list of gift tags for all occasions and situations--including fashionably oversize gift tags and gift tags for "gifts from the kitchen." Microsoft Office has a bunch of holiday gift tag templates for Microsoft Word. 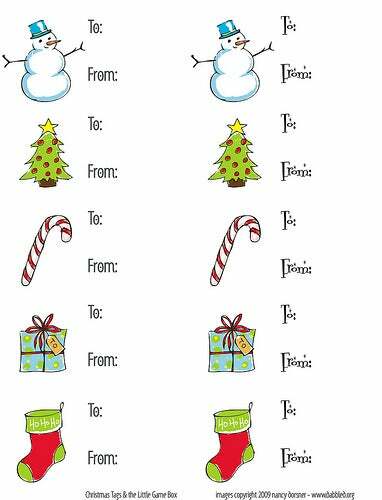 You have two choices for printing out gift tags: You can print them on regular paper (thicker is better) and affix them to your presents with tape, ribbon, or colored string, or you can go the extra step and print them on sticker paper (try Avery Sticker Makers Printable Sheets).